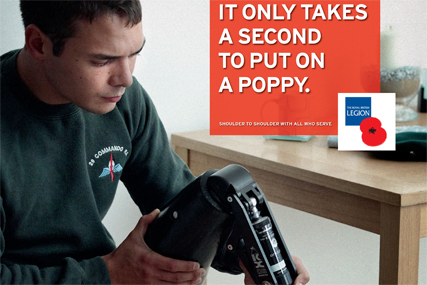 The Royal British Legion, the charity behind the annual Poppy Appeal, is relaunching its bi-monthly print magazine and developing more digital content to raise awareness of its lesser-known work and services. The charity, which provides financial and social support to members of the armed forces, has appointed customer publishing agency John Brown to handle the task. It wants to showcase its lesser-known work and raise awareness that it spends over £50m a year on a whole range of services and investments, including rehabilitation services and provision for servicemen and their families. The membership magazine will be made "more accessible and modern" when it is relaunched from the May edition. Additional content will also be produced in digital form and will be featured in a range of media aimed at a wider audience including supporters and the public. John Brown will also handle ad sales for the magazine and bring in new brand partners and revenue streams. Bob Gamble OBE, head of membership at The Royal British Legion, said: "Now is the right time to move forward and we firmly believe the new work will act as a real catalyst in helping to change perceptions, and build even greater knowledge and support for the work we do."